Because of the short and easy nature of the trail, you can knock out a good hike in 30-40 minutes’ time. But that doesn’t mean that you can’t linger. 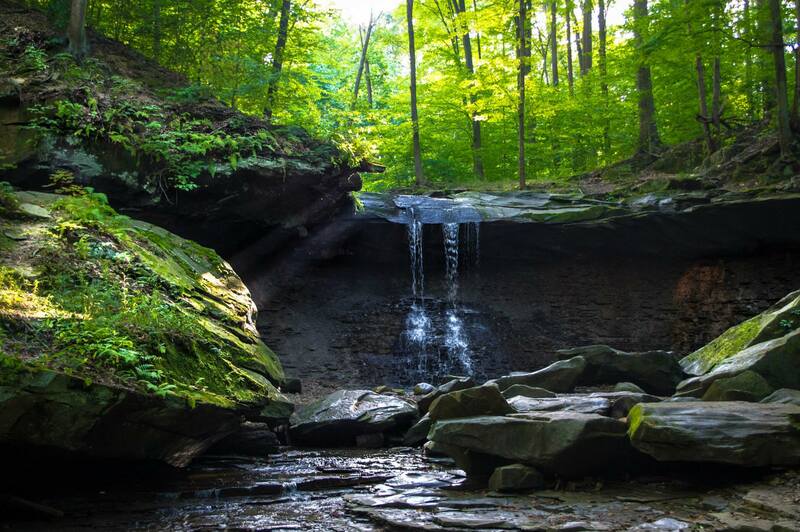 Blue Hen Falls makes for a great family hike, filled with lush surroundings and one of Cuyahoga Valley’s most beautiful, famous waterfalls. Nature lovers, photographers, and artists are going to love it, too—so if you’re a trekker who arrives here sans camera or sketchbook, only to be enchanted by your surroundings, we can only say that the odds you’ll come back for an encore are pretty good. From the north, take I-77 south to Miller Road exit. Left on Miller Road to Brecksville Road, right on Brecksville Road to W. Boston Mills Road, then make a left. Continue on W. Boston Mills Road to Black Road, turn left on Black Road, then make a quick right back onto W. Boston Mills Road. From the south, take SR-8 north to E. Boston Mills Road exit. Proceed west on E. Boston Mills Road Parking is officially located at 2001 Boston Mills Rd, Boston Twp., with overflow parking immediately surrounding. Entrance to the park is free. For starters, at a half-mile, enveloping this stop into a longer day of hiking in the CVNP is easy to do. Blue Hen Falls is a modest torrent of water and there’s eloquence to this quiet oasis that trekkers can’t help but love. You’ll be dazzled by shimmering greens and blues in summer and deep reds and oranges in the fall. On any given day, you’ll spot amateur and pro photographers and artists here practicing their skills. Getting to the waterfall is fairly easy, as is the footing, and the trail has a wooden footbridge crossing Spring Creek that ultimately leads you to the sandstone-and-shale waterfall. If you’re looking for a tougher trek, Blue Hen Falls Trail also connects you to the challenging and rewarding Buckeye Trail for a longer adventure. Families, kids, hikers who love a good eyeful, and waterfall enthusiasts—though not necessarily in that order. Because this trail is short and easy, children of all ages can do it and love it. Split rail fencing separates hikers from the rocky overhang, so small children may require some additional supervision. But if a mossy glen of Zen is your cup of tea, there’s no doubt this should be a stop on your list.